Our bank feed provider (Yodlee) gives us rudimentary categories for each transaction that it gathers from your bank. These provide a great starting point for many people! However, as you get used to PocketSmith and set up your own categories you may wish to turn this off. This will stop your transactions from being assigned to categories created by the bank feed. If you would prefer the bank feed to no longer create new categories for you automatically, follow the steps in the following section Turning automatic categorization from the bank feed off and on. When turning this feature off, consider setting up Category Rules, and Filters to categorize future transactions the way that best suits you! What affects the quality of the categorization provided? One of the largest factors contributing to the quality of categories created is the country associated with your bank feed. Merchants in the United States are categorized more accurately as the majority of Yodlee's connected banks are in the US. Turning off the automatic categorization from the bank feed won't turn off any Filters or Category Rules that you have created. 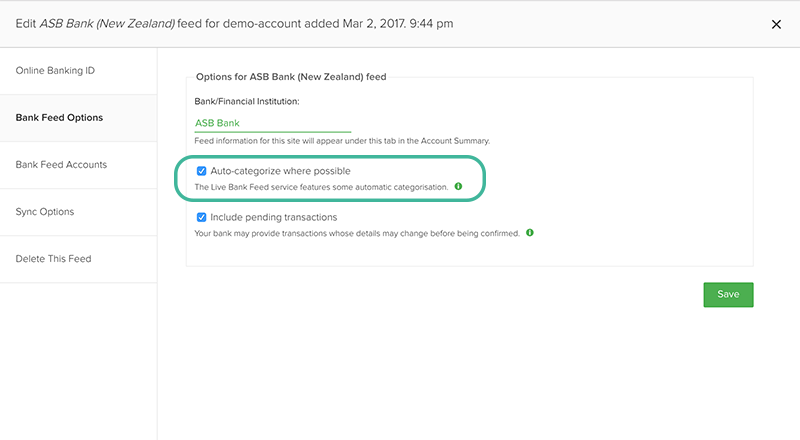 There are a couple of options for overriding bank feed automatic categorization. If you create any Filters or Category Rules for categorizing transactions, these will override categories applied automatically from the bank feed. One of the best ways to have control over your categorization is to use Category Rules. After applying a Category Rule to a transaction, that rule will apply to all matching uncategorized transactions as they are imported into PocketSmith, assigning categories for you and making categorization quick and easy!